This isn’t one of those long, boring blogposts about fancy dishes and fabulous ambience. It’s got no description of food texture nor discussions on flavor balance. Nope, not one single mundane picture of a melting chocolate cake or truffle infused pasta or caviar studded steak. This post is just to talk to you about something I’ve been doing for a month now and how it’s changed me as a person. And what did I do? Well. I fed a stranger. Feed A Stranger is a social campaign. The concept is simple – every day I spend X amount of money to buy some juices & fruits and hand it over to someone I see on the streets, who I feel needs the refreshments. I approach them and ask if I can give them the packet. Once they approve, I give it and further ask their permission to click a picture of theirs. If they agree, I click, say good bye and leave. These are who we can call “absolutely anybody”. It could be a man in a suit, sweating profusely as he is struggling to fix his burst car tire. It could be the blue-collared worker, carrying a sack of cement under the horrible summer sun. If you feel the person can really do with something to hydrate himself, you have your stranger. What can you give him? What could do him good – a bottle of water, lemonade or similar juice, a bottle of chilled laban, couple of bananas, couple of apples, a pack of biscuits – you get the drift. All of those, or at least one of those. Why should you post about it? When I started posting the pictures of the people who accepted my tiny token of consideration, with wide, open smiles, I was flooded with questions. “How do you approach them?, “Don’t they mind their picture taken?”, “What if they refuse?”. So many questions came to light which I was able to answer and clarify, thus hopefully, paving the way for a lot of other people like me to join the campaign as well. The picture post is not to shame those gentlemen who graciously accept our silly bags. It is to ensure others wanting to help, that it is perfectly okay to do so, and that it will be accepted with a smile that can warm your day. For years, I took cabs to work from under my building. For months, I walked along the roads under my office building. I never ever noticed the men around me, digging the tunnels and tidying the roads. They were faceless people. Presences that didn’t matter. I don’t mean to say it is horrible, but that was just how it was. And then I fed them. One yesterday, the other the day before. I spoke to them, clicked their picture, guessed their mother tongue and marveled at their endurance. The wait under my apartment got dotted with “Good morning madam”s and the walk under my building got sprinkled with nods of gratitude and acknowledgment. Selfishly, I felt good. Like I’m doing something meaningful. But even better, was the fact that I could recognize those faces from their friends. I now realize that I had fed some strangers, who before the last bite of bananas was taken, were no longer strangers. I now involuntarily do a mental math of the number of people I could have provided packets for, if I miss that extra side order or that unnecessary manicure. I’m not claiming to be Mother Teresa here, but honestly your thoughts will start amazing yourselves. And I really think you should, for at least a week to see if there is any light in any of this. I would love for you to provide a package of refreshments as and when you can, to someone you think really needs it. If they do not mind, click their picture. 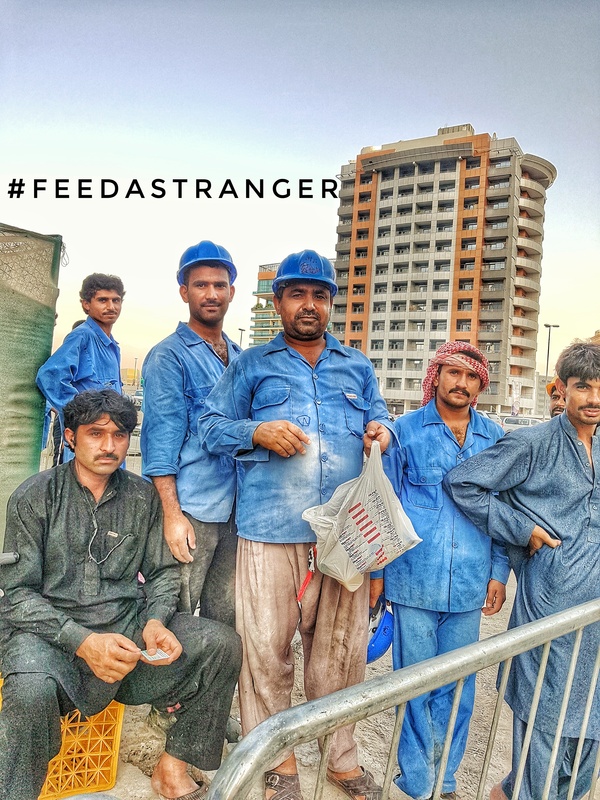 Else photograph the package you are giving and post it online with the hashtag #FeedAStranger. If you do this, your friends and family will know this isn’t something out of television, and can be easily done by themselves as well. The inspiration that gets spread around will be incredible.